Today is our 9th wedding anniversary. Our 1st 9th wedding anniversary, that is. Our 2nd 9th wedding anniversary will be in February next year. Here’s what happened. 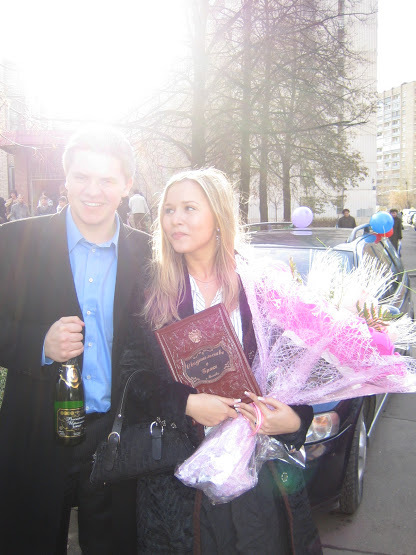 A Ukrainian and a Russian, living in London, decide to get married. (I’ve actually written about us getting together and an unconventional marriage proposal here). This decision comes with lots of happiness and congratulations from everyone around, but also with quite a dilemma – where should the wedding take place? London? This option seemed quite pricey both for us to make a party and for everyone, who was not from UK, to fly over and stay there. My home town in Ukraine was deemed unsuitable as anyone coming from outside Ukraine would have to book 2 flights – 1st to Kiev and 2nd to my town. We didn’t want to ask people to spend more then they had to to get to our wedding and no matter where we would’ve decided to hold it, there would always be other guests who still needed to travel – benefits (or difficulties) of living internationally. I love Kiev. It’s a very beautiful city and very cosy at that. Getting married in a Kiev Pechersk Lavra, a historic cave monastery complex with amazing churches and a cathedral, was an amazing option. One problem – apart from a couple of our friends, we had no family members and no connections in this city. Try planning a wedding from abroad in such a situation. Nevertheless, this is exactly what we did – but that was our 2nd, winter, wedding. 1st wedding was a civil wedding and happened in Moscow out of convenience. My husband’s parents lived there, we knew people who could help us arrange all the paperwork while we were still in London and we just had to fly over for a long weekend to actually get married. As we did not want any celebration that day and just wished for all the matters to be settled as quickly as possible, people in the registry office told us to come over in the morning. 8am, both of us dressed smart casual, determined and a bit sleepy. The morning was gloomy, cold and it actually started snowing – November in Moscow is not known for a suitable wedding weather. Although, we brought all the necessary papers, showing that we live abroad and just flew over here for a couple of days, initially it looked like the registration would not happen – registration office clerks could not agree between themselves whether or not they should register us now or make an appointment for us to come over in a couple of weeks. The idea of taking extra days off work and paying for another set of tickets did not go down well with us. Thinking about all the amazing possibilities of rescheduling the registration, gloomy and concentrated, my husband looked like a person, who got dragged into this establishment, getting looks of sympathy from other grooms. Finally, we were told that we can indeed get married now and should proceed to the office to sign the papers. ‘Would you like to exchange the rings?’ – ‘No, thank you.’. ‘Would you like to kiss’ – ‘No, thank you’. ‘Then, I pronounce you husband and wife!’ Thank God. No fuss and straight to the point kind of wedding. When we emerged from the building a couple of hours later, a bit stressed out, but utterly happy that all the formalities are over and done with, we were greeted by bright sunshine, flowers and champaign. We had a dinner with our parents, my sister and my husband’s brother, where we exchanged the rings, kissed and relaxed. Actually, our married life seems to resemble our wedding – hard to schedule due to travel, hectic but with things falling into places somehow. Congratulations! I can’t wait to read about your Kiev wedding! Congratulations!! I actually just came back from a coworker’s wedding. He is British and the bride is Korean. They had their Korean wedding today, and they’re having a British wedding in England next year! Good luck…keep on keeping on!